The Fort Pitt Museum is a 12,000-square-foot, two-story museum located in Pittsburgh's Point State Park at the tip of downtown Pittsburgh's Golden Triangle, where three rivers converge. The museum tells the story of Western Pennsylvania's pivotal role during the French and Indian War, the American Revolution, and as the birthplace of Pittsburgh. First opened in 1969 in a reconstructed bastion, the Fort Pitt Museum presents Pittsburgh's early history through a variety of interactive stations, life-like museum figures, and artifacts. Three recreated rooms detail life inside the fort as it was in the 1750s: a fur trader's cabin, a storage room for munitions, and a British soldiers' barrack. Artifacts at the Fort Pitt Museum include an American Indian powder horn featuring an underwater panther; items from General Braddock's expedition, such as musket balls and rifle locks; General Lafayette's 1758 six-pounder cannon marked La Embushcade (the ambusher); and a pewter writing desk inscribed "Fort Pitt Provincial Store, 1761" that belonged to Josiah Davenport, Ben Franklin's nephew and a local fur trader. The first-floor gallery offers a wide range of interactive exhibits where visitors of all ages learn about daily life in 18th-century Pittsburgh. The diorama presents a glimpse of that era in miniature. Visitors can bring furs to market at the Trader’s Cabin; peer inside a replica Casemate to see munitions being made; and learn about the artillery that protected the fort during the French and Indian War. The strategic location of the Fort Pitt Museum has shaped the course of history. Fort Pitt helped to open the frontier to settlement as Pittsburgh became the “Gateway to the West.” Follow the museum's Fort Pitt Timeline exhibit from 1754, when British army Captain William Trent arrived to establish the first fort at the Point, to 1778, when the first peace treaty between the U.S. and American Indians was signed at Fort Pitt. The DAR, or Daughters of the American Revolution, owns the Fort Pitt Block House, which adjoins the Fort Pitt Museum. Built in 1764, it is the only surviving structure of the original Fort Pitt and the oldest building in Pittsburgh. The tiny blockhouse, which once provided quick cover for people caught outside Fort Pitt when it came under attack, was converted to a residence in 1785. It served as a private dwelling until 1894 when it was gifted to the Pittsburgh Chapter of the DAR. The Block House is not part of the Fort Pitt Museum, but a self-supporting, privately owned historic museum with no admission fee. 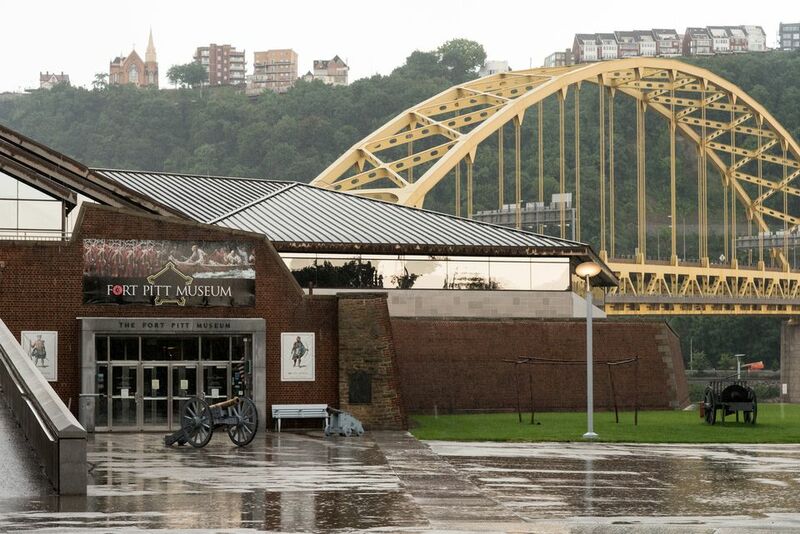 The Fort Pitt Museum is located on the grounds of Pittsburgh's beautiful Point State Park. While visiting the museum, save some time to enjoy this National Historic Landmark. Walk along the accessible paved riverfront promenades, which overlook Pittsburgh's scenic hillsides and many bridges. A 100-foot-tall fountain enhances the beauty of the park, and visitors may picnic on the lawns. Hiking and biking trails, along with fishing and boating opportunities, make this park a great place to spend a day.